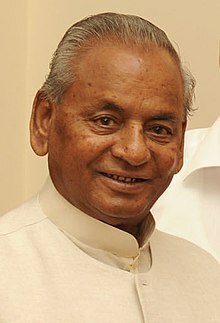 The following is a list of governors of Rajasthan. ^ a b "Previous Governor". Government of Rajasthan. Archived from the original on 19 August 2014. Retrieved 16 August 2014. ^ "Photo Gallery of Governors". Legislative Assembly of Rajasthan. Retrieved 16 August 2014. ^ Cahoon, Ben. "States of India since 1947". Retrieved 22 December 2014. ^ "Former Governors". Raj Bhawan, Rajasthan. Archived from the original on 27 June 2014. Retrieved 16 August 2014. ^ "Governor of Himachal Pradesh gets additional charge of Rajasthan". Rashtrapati Bhavan, New Delhi Press Release Dated. 2 December 2009. Retrieved 22 October 2013. ^ "President appoints Governors". Press Information Bureau, New Delhi Press release dated 16 January 2010. Retrieved 22 October 2013. "Governor of Rajasthan". Government of Rajasthan. Archived from the original on 19 August 2014.